Geraldine “Gerry” (Keating) Ellis – in Woburn, January 29th at eighty six years of age. Beloved wife of the late Raymond L. Ellis. Devoted mother of Raymond Ellis of Woburn, Doreen Salvi, her husband Alfred of NH and Patricia Graffam, her husband Steve of Malden. Dear sister of the late Charles, Bernard, Paul, Herbert, William Keating, Mildred McDermott, Alice Nelson, and Helen Feeney. Cherished “Nana” of Alfred Jr., and Jason Salvi, Edward, Steven, and Mark Graffam and Great” Nana” of Cole, Kayleigh, Adrianna, Juliette and Kendall. Also survived by many loving nieces and nephews. A Funeral will be held in the Lynch-Cantillon Funeral Home, 263 Main Street, Woburn on Wednesday, February 6th at 10 a.m. Relatives and friends are respectfully invited to calling hours in the Funeral Home, Tuesday evening 4 – 8 p.m. Remembrances may be made in honor of Gerry to NuPath, 147 New Boston Street, Woburn, MA 01801. 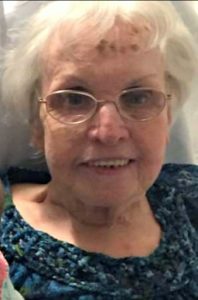 Geraldine “Gerry” (Keating) Ellis, a life long resident of Woburn, passed away at the Woburn Nursing Center, Tuesday, January 29th at eighty six years of age. Gerry was the beloved wife of the late Raymond L. Ellis . Born in Woburn, Gerry was the daughter of the late Jeremiah and Sarah (McCue) Keating. Raised and educated in Woburn, Gerry was a graduate of Woburn Senior High School along with the Class of 1950. Gerry married her sweetheart Ray Ellis in the late fifties and they brought two daughters and a son into the world, to whom they were so proud and dedicated too. Sadly Ray passed away in the early seventies, and Gerry totally devoted herself to raising her family by herself. Very much a “home body” Gerry always enjoyed her home and it was always a very comfortable and welcoming place to be! She was always watching the cooking shows and learning new recipes to practice on her family. When both daughters married and began having children of their own, “Nana” could not have been happier. She loved spending time and sharing as much time as possible with them. Ray, her youngest son was Special Needs and Gerry made sure that every day he was up and at’em! along to school and later becoming an active participant at NuPath here in Woburn. On the days Ray was not involved in any scheduled activity she and he would go off to Lake Quanapowett or even Horn Pond and enjoy a walk or sitting on the benches, enjoying the day right next to the water. Another place they liked to visit was the Tewksbury Airport where they would watch the hub-bub of the airport and the planes taking off and landing. A dedicated loving woman, all throughout the years her family was first and foremost, which was truly a wonderful gift to all. She will be missed. Devoted mother of Raymond Ellis of Woburn, Doreen Salvi, her husband Alfred of NH and Patricia Graffam, her husband Steve of Malden. Dear sister of the late Charles, Bernard, Paul, Herbert, William Keating, Mildred McDermott, Alice Nelson, and Helen Feeney. Cherished “Nana” of Alfred Jr., and Jason Salvi, Edward, Steven, and Mark Graffam and Great” Nana” of Cole, Kayleigh, Adrianna, Juliette and Kendall. Also survived by many loving nieces and nephews. A Funeral will be held in the Lynch-Cantillon Funeral Home, 263 Main Street, Woburn on Wednesday, February 6th at 10 a.m. Relatives and friends are respectfully invited to calling hours in the Funeral Home, Tuesday evening 4 – 8 p.m. Remembrances may be made in honor of Gerry to NuPath, 147 New Boston Street, Woburn, MA 01801. God bless you Aunt Geraldine and your family. I was lucky to have spent some time with you last spring. You will be missed, but never forgotten. On behalf of NuPath, we send the Ellis family our deepest condolences. Mrs. Ellis was a terrific lady and she will be missed. Geri was a lovely sweet woman. She will be missed. I’m so very sorry to hear about the passing of our Aunt Geraldine. she was a very kind and loving person. The last of the original Keating Clan. I pray God will bless her and Keep her in his loving arms. I know she is now reunited with her loved ones that have gone before her.